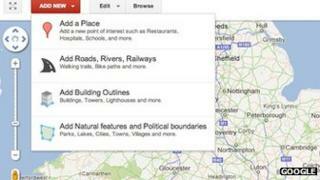 Google is expanding its Map Maker edit tools to the UK. The browser-based software allows users to add details about buildings, hiking trails, vegetation and other features to its maps of the country. Suggested additions and amendments are reviewed by other users and the firm's own staff before going live. The move comes at a time when Apple, Nokia and others are investing heavily in rival "free-to-use" mapping technologies. Experts suggest the rise of GPS-enabled devices means the efforts could hold the key to future profits if the firms add location-triggered adverts or use the data to promote situation-specific services. But for now they see little or no financial return from their current smartphone map apps beyond the value added to their brands. Google first launched its Map Maker service in 2008 to allow users to help it add details to its maps of Pakistan, Vietnam and just over a dozen other countries. It allowed the firm to fill in blanks to the third-party data it had licensed at a time when its own cartographers were focused on other territories. The company later extended the facility to much of the rest of the world including the US, France and Australia - countries where it also uses sensor-equipped cars to collect mapping data. Google said there were "technical obstacles to overcome" when merging any of its existing data with Map Maker, helping explain why it had taken until now to bring it to the UK. Ahead of the launch workers at Bletchley Park - the site of Britain's World War II codebreaking efforts - trialled the software to help promote the roll-out. The search giant had previously donated money towards the estate's restoration fund. Places - such as a gym, bank, cinema or bus station. Roads, Rivers and Railways - including hiking trails and bicycle routes. Building Outlines - allowing the inclusion of 3D graphics for offices, houses, monuments and other structures. Natural Features and Political Boundaries - including lakes, parks and shrubbery. Click-through menus allow specific details about each feature and relevant internet links to be added. There is also an option to edit pre-existing objects. Users wishing to amend the firm's UK maps had previously only been able to report problems or suggest limited changes. Before alterations are made to Google's live maps other contributors must review the suggestions. To encourage this Google lets users click a button to show proposed alterations in their neighbourhood, and Map Maker Pulse - a constantly updating display of submissions made across the UK, each one shown seconds after it is uploaded. Volunteers build up a confidence score as more of their submissions are approved and after a while require fewer checks. "We have a trust moderation system in place and that algorithmically figures out whether we can trust this person and how sensitive the feature is," project manager Jessica Pfund told the BBC. "No matter how trusted you are if you change a very prominent feature, like a Tate art gallery, it's going to have to go through a lot more moderation than if you add a small restaurant to the rural countryside." She added that users could expect accurate additions to go live within a few days of them being proposed. Ms Pfund acknowledged that in its current state Map Maker did not work well on mobile devices, recommending it only be used on PCs. Users may also wish to bear in mind the firm's terms and conditions which state: "You give Google a perpetual, irrevocable, worldwide, royalty-free, and non-exclusive licence to reproduce, adapt, modify, translate, publish, publicly perform, publicly display, distribute, and create derivative works of the user submission." One contributor to OpenStreetMap - a separate crowdsourced effort to map the world - suggested Google's terms might make its maps unsuitable for some. "The biggest problem with Google Map Maker is that anything people contribute may appear on Google's map, but only Google can get at the underlying data to be able to do anything else with it," said Chris Hill. "If someone includes a Google map on their web site to show where their business is they may also be showing where their competitors are and they can't change that." Others too are trying to outsource at least part of their cartographic efforts to volunteers. Apple's chief executive, Tim Cook, said his firm appreciated feedback when he apologised in September for the rocky start to the iPhone maker's own app, promising "the more our customers use our Maps the better it will get". Nokia is also beta testing its own browser-based Map Creator facility for its Here maps product - but within Europe the tool is currently limited to a few islands belonging to Norway and Denmark. Tech consultancy Gartner says Google's market leading position as the most popular map data provider for smart devices remained secure for now, but adds it will be mindful of rivals' efforts. "Google needs to continue to continue to invest to stay ahead - it's not going to be a free run as it has been so far," said consumer devices analyst Carolina Milanesi.